Few challenges in life have the power to break you down to the point of tears. 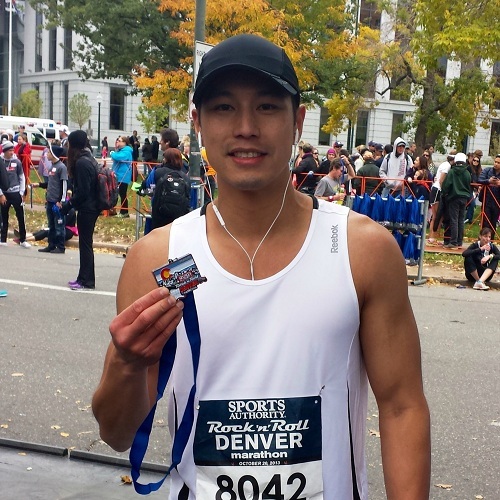 My recent experience at the 2013 Denver Rock N Roll Marathon was one of them. The course and conditions were tough. It seemed as if you were always facing a 12mph headwind, no matter which direction you ran. The hills were plenty and unforgiving. And the distance was unreal. Aside from actually running 26.2 miles, I believe nothing can prepare you for it. Not 20, or 22, or even 24 miles. Here’s a recap of my first marathon, or as I consider, the worst run I’ve ever had. I got to the race an hour before the start. It was pitch black and around 40 degrees. Warm-up, eat a banana, stand in porto-potty line for 20 minutes. It was the usual routine. My overall goal, based on my long runs during training, was to finish in 4:24, which is a 10 min/mile pace. My stretch goal was to finish in 3:59, since a 9:09 min/mile pace didn’t seem that bad. And because I thought having the number 3 in front looked cool. With tons of adrenaline and freshly rested legs, I came out strong. I wasn’t sure what my pace was, but it felt like any other LSD (long slow distance) run during my training. Just another Sunday run, Alex. 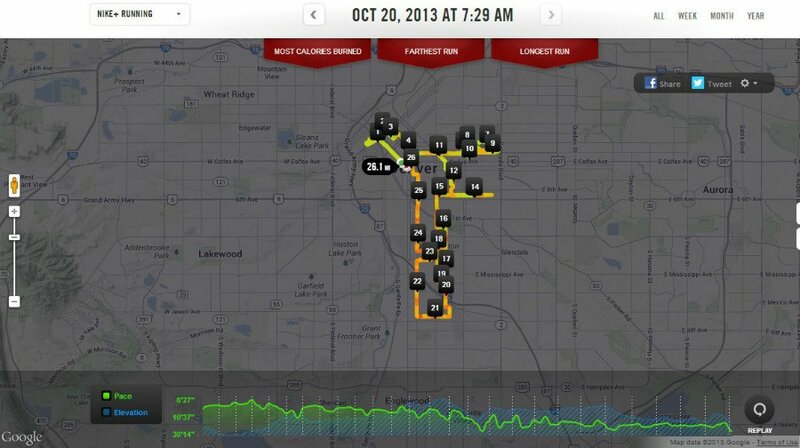 The course snaked through Downtown Denver in the beginning. For some reason, I don’t pay much attention to my surroundings while running races. I honestly don’t remember what streets or landmarks I was near. I was simply focused on my form and breathing, turning my legs over, and weaving through the masses. Downtown looked great in the post-run pictures though. Woah, I just PR’d my half marathon. I feel fantastic. I could do this forever. Maybe I can finish in 3:50. A couple minutes later, it all came crashing down. Literally. Halfway into Mile 14, my left calf seized. I immediately collapsed in the middle of the road. Shortly after, my right calf and quad cramped as well. The pain was excruciating. There was nothing I could do to stop the spasms and tightening of each muscle. Fortunately, there was a couple watching the race down the road. I called for them to help me. By the time they reached me, my body had contorted into what I can only describe as an “exorcism” position. It was not pretty. It was the worst thing that could have happened to me (other than getting injured). I could deal with wind, hills, stomach issues, fatigue, and hitting the Wall. But how was I suppose to go on if I could barely walk? I couldn’t get up on my own and had to be helped up. I hobbled along for half a mile before the cramps hit again, forcing me to pull over. A wave of emotions hit me as I sat on the side, watching the other runners and seconds go by. How could this have happened? Why today? I had run dozens of 13+ mile runs with less hydration and similar pacing and never cramped once. I didn’t know how I could possibly continue for another 13 miles. I seriously considered withdrawing. It’s hard to admit, but I broke down at this point. I had trained and sacrificed so much to be here. And then I thought of my brother and sister waiting for me at the finish, who had woken up early to come support me in the dreary cold. I decided that if I couldn’t do this for myself, then at least I could finish for my family and others. Also, there was no way in hell I was letting this pain last forever. All the techniques I had gained from doing hill sprints, strides, and tempo runs went out the window. I was now reduced to the “marathon shuffle”. The next 10 miles were agonizing. The cramps never stopped, leaving me constantly wondering which step would be the one where my calf muscle would spasm and come off the bone. I was forced to stretch at more trees, stop signs, and street poles than I can remember. Each time afterwards, I’d take a deep breath, re-focus, and pinpoint the next landmark in sight to aim for. By Mile 22, many people had slowed considerably. I was having a tough time at this point and paused to regroup. Moments later, a guy passing by gave me a pat and said, ‘Hang in there buddy, you can do it”. I really appreciated it, and made it my new mantra for the rest of the race. The last two miles truly epitomized the phrase “so close, yet so far”. They were the longest miles of my life. To my surprise, the support in this section (and the whole race, as a matter of fact) was amazing. Everywhere I looked there were banners, cowbells, and people cheering you on. Any kid I ran by got a high-five or smile. Have to be tough for the kids, no matter how much it hurts. I crossed the finish line at 4:05:13. It didn’t feel real at first. But when I had the finisher’s medal in my hand, I knew I had made it. I can’t describe how happy, proud, and alive I felt at that moment. A little ways ahead, I heard my name being shouted. It turned out to be my family and some friends who had stuck around after finishing their half-marathons earlier. It meant a lot seeing everyone brave the cold and wind to support me. Sometimes, you just don’t feel you deserve the amount of love given to you. When asked how the race was, the impact of everything I endured emotionally and physically over the past 4 hours hit me. It was amazing, it was terrible, and it was.. disappointing. Not that completing a marathon wasn’t an accomplishment on its own. But because I felt I was capable of so much more. I’ve had a chance to reflect on the race and realize that a disappointing performance isn’t necessarily a bad thing. In some ways, I’m glad for the adversity and misfortune I faced that day. Because how often in life do we have a chance to test our resolve and will against its limits? To push ourselves farther than we’ve ever gone before. People chuckle when I tell them my marathon was a life-changing experience, but I came out a different person after this race. For me, the marathon was a perfect reminder to embrace the challenges and obstacles you face in life, because they are opportunities to grow from. I learned so much about myself and what I was capable of during this race. At one point, I vowed never to do another one of these again. But who was I kidding. I can’t wait for the next one *wink*.